One week after a terrorist opened fire on Muslim worshippers in the twin-mosque terror attack in Christchurch, killing 50 innocent civilians, New Zealanders gathered to mourn. 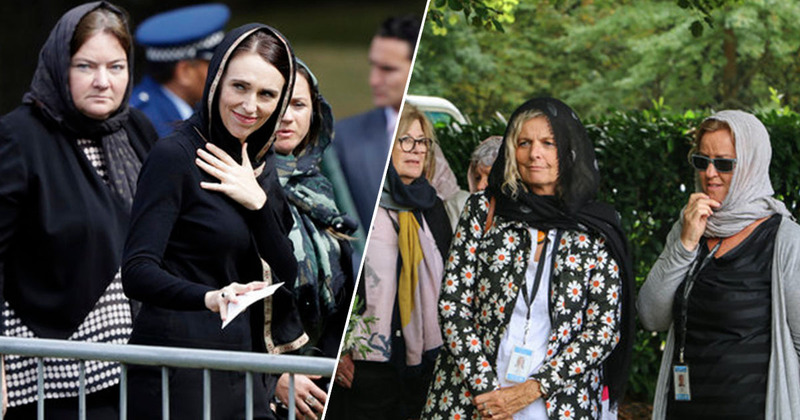 Among the crowds, who congregated in Hagley Park opposite the Al Noor mosque to observe the call to prayer, non-Muslim women wore headscarves in solidarity with their countrymen and women of the Muslim faith. Thousands more listened and watched as the event was broadcast live, with the prayer followed by two minutes of silence, in what’s been called a ‘nationwide reflection’. Just a day after she outlawed ‘military-style’ semi-automatic firearms and high-capacity magazines, the likes of which were used in the terror attack, Prime Minister Jacinda Ardern joined civilians to show solidarity with those in mourning. She, along with many other women, wore clothing to cover their heads throughout the event. These people are New Zealanders, just like I am. I understand that one day is very different to wearing it all the time, but I am honored to be given the permission of the Muslim community to walk in their shoes. Even just for a day. … One bad egg doesn’t represent Australia, one bad egg doesn’t represent New Zealand. This terrible attack does not define us. The Prime Minister has become a bastion of love and unity in her leadership in the week since the attack, and praised for her quick action to prevent an atrocity like this from happening again. The gun legislation is supported by Ardern’s liberal Labour Party and the conservative opposition National Party, so it’s expected to pass into law. An immediate sales ban on military style weapons went into effect on Thursday (March 21). New Zealand does not have a constitutional right to bear arms. With decisive action against white supremacist terror, New Zealanders have gathered to heal. Also in attendance was the Al Noor mosque imam, Gamal Fouda, who thanked New Zealanders for their support. This terrorist sought to tear our nation apart with an evil ideology… But, instead, we have shown that New Zealand is unbreakable. We are broken-hearted but we are not broken. We are alive. We are together. We are determined to not let anyone divide us. Later in the day, a mass funeral was held to bury 26 of the victims at a cemetery where more than a dozen have already been laid to rest.